I realized the other day (when I was slacking off instead of finishing my upstairs renovations) that I have not done any curing for a while (other than my prosciutto - nearly at the one year mark now). So, instead of continuing with said renos I went out to procure some meat. I ended up at a great Polish grocery store that has a massive cured meat and fresh meat butcher area. Sitting in the casing was a beautiful selection of boneless pork butts and they all looked like coppa cuts. After inquiring with the butcher (an old school Polish gentleman who barely spoke English) I more or less was able to confirm they were all coppa cuts. So of course I grabbed a nice big one! Next, the top sirloin beef roast was staring back at me, tempting me to smother it in cure and turn it into something even more magical. So, into the basket that went as well. Due to work restrictions (and a lack of juniper berries when I got home - gasp!) I postponed for a day until this morning. I shopped around for a few recipes and settled on Jason Molinari's blog for inspiration. The Bresaola is pretty much the same recipe, the Coppa I added some garlic and mace. Ground spices/herbs/cures together for both, rubbed them generously then into vacuum bags they went with any remaining cure that had fallen joining them. Sealed, labeled and into the fridge they went. I figure on a 21 day cure (maybe a few days shorter) turn them now and then, rinse, dry, stuff into beef bungs, inoculate with Bactoferm 600, allow to bloom in a warm fermentation chamber for 12 hours, then dry until 40% weight loss. Sound good? You're lucky to be able to get coppa like that, I don't make it any more 'cos I would have to buy the primal and cut it myself. I'm unable to that now. 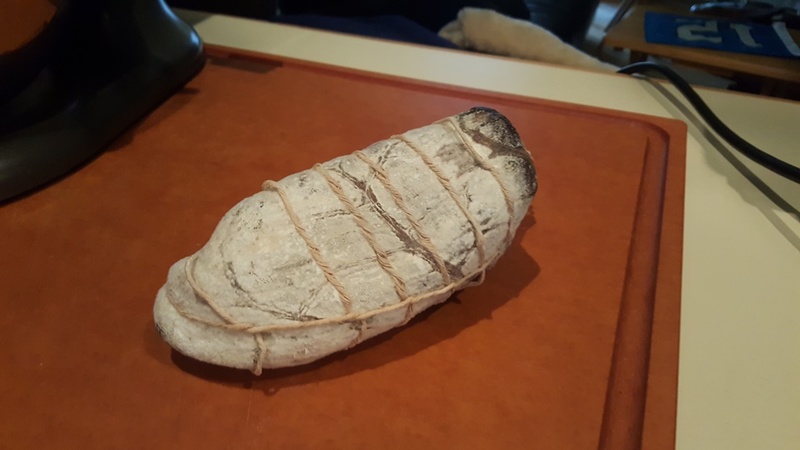 Jason's blog is the 'go to' place for salumi recipes. That said, some are a bit heavily spiced for me; I like to let the meat speak for itself. This morning I pulled my beef bungs out of their water bath, washed them out well and gently stretched them as I did. Stuffing the meats was a little more trouble than I thought as it was my first time using bungs but I got there eventually. Used some tight netting to keep a nice round shape, punctured holes throughout with the salami pricker, gave a bath in some mold solution I had innoculated for 12 hours. I was planning on keeping them somewhere warm and humid for some time but couldn't be bothered so omitted that step and into the curing fridge they went. Ranges between 11.5-13°C and humidity was reading 68% prior to placing inside. Upped the humidity to 80% now and will leave them to dry. Wonder if the mould will bloom despite skipping the warmer stage? In the chamber, smaller one in back is the Bresaola, larger one the Coppa. Beside it is my one year old Prosciutto, still humming along. I inserted some skewers at the key points the other day and it smells perfect, no off odours. I was hoping the ham was going good because I would like to try one this Fall. NCPaul wrote: I was hoping the ham was going good because I would like to try one this Fall. I have made these 2 exactly the same but EQ cured and dried them in the Tub-Ex bags. UMAi in the US/ Banquet bags in Australia. The end results were great. All the drying was done in our kitchen fridge. Both were finished off in vacuum bags for about 3 weeks for obvious reasons. 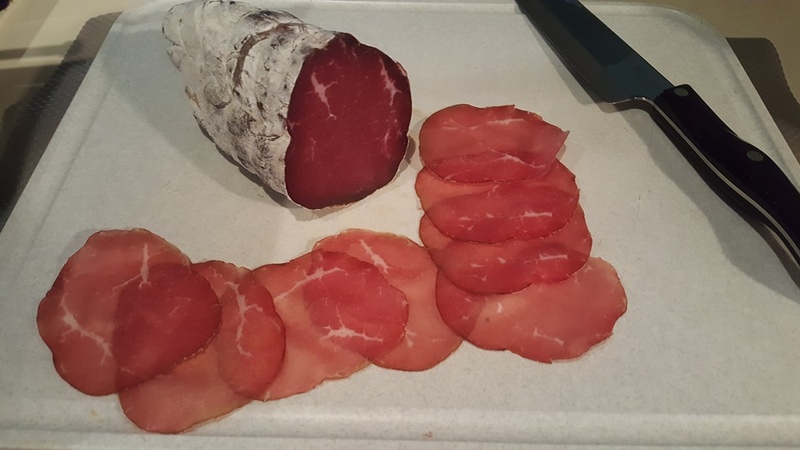 Bresaola is ready, got it to 38% weight loss and happy with the feel of it. Coppa is only at 35% so I'm going to leave that a little longer to get to around 40%. The casing was covered in a good heavy mold. I removed the casing and put it into a vacuum bag where it will remain in my fridge a few more weeks before I try it. moldy meat wrote: that looks awesome! Thanks! I hope it tastes awesome too! Smell is great, slight cured funk to it but I can still pick up most of the spices too. One thing this hobby teaches is patience - something I was very short of before getting into curing lol - and it was extremely hard not to slice some to taste. But I think the vacuum stage is important and it will elevate it to the next level by equalizing the meat and letting it mellow. So I finally achieved 40% weight loss on the coppa. 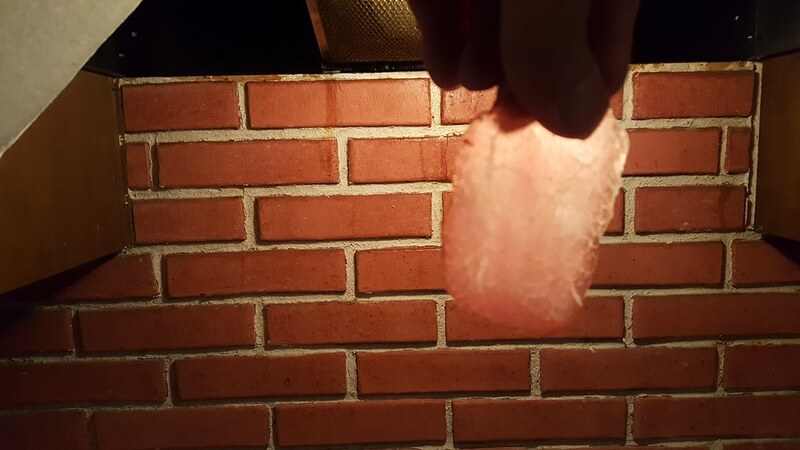 I guess being fattier than the bresaola meant it dried slower. Anyway, peeled off the casing and vacuum packed it for a fridge rest. The bresaola has been resting a few weeks, going to hold off for the weekend and give it a taste then. My brother likes to toast an English muffin and put a little mayo on both slices. He takes four thin slices of coppa and warms / fries them in a pan. When he flips them over he adds a slice of muenster cheese on top of one of the coppa slices. When the cheese starts to melt, he puts two of the coppa slices on one half of the English muffin and the rest on the other half. He then cooks an egg over easy and adds it to the breakfast sandwich. His version of an "Egg McMuffin". NCPaul wrote: My brother likes to toast an English muffin and put a little mayo on both slices. He takes four thin slices of coppa and warms / fries them in a pan. When he flips them over he adds a slice of muenster cheese on top of one of the coppa slices. When the cheese starts to melt, he puts two of the coppa slices on one half of the English muffin and the rest on the other half. He then cooks an egg over easy and adds it to the breakfast sandwich. His version of an "Egg McMuffin". That sounds awesome, I will have to try it! 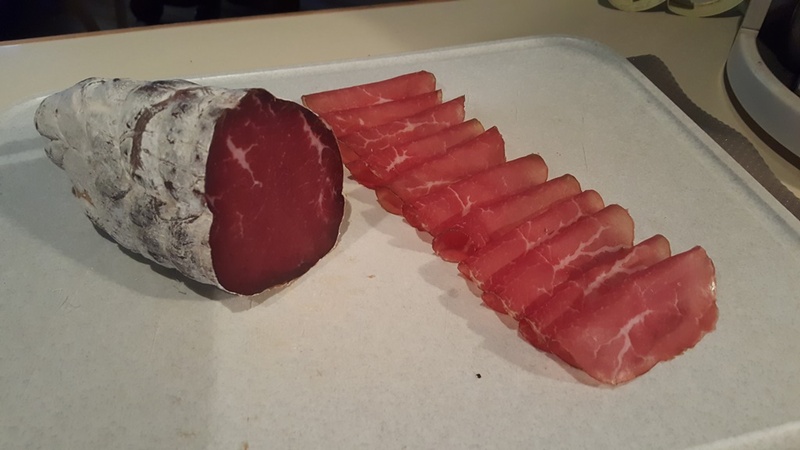 my bresaola came out of the curing chamber a couple days ago. the flavor is mild and not too salty. the meat is tender with a creamy texture. NCPaul wrote: Great job MM! thanks! i can't wait to cut into my coppa. they still have about 60 grams of weight to lose.